A good and functional item, the paracord bracelet aka survival bracelet, not a survival kit in itself but a good addition to a survival kit. By always wearing some type of bracelet you will have any where from 5 - 25 feet of spare cordage on you depending on the bracelet type. 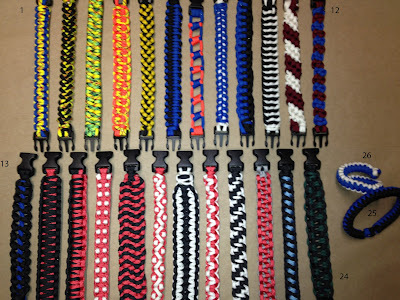 So far I have made 26 different bracelet styles, these are all just practice ones and just for fun. Now though, I am kind of obsessed to try and see how many different types I can actually make. All can be made through mainly YouTube video instructions. I have adapted almost all to use a buckle. I will be using the name that was on the video where I got the instructions from (so you can find it easier if you so desire), the names may or may not be correct. If I can remember who created the video I will add that as well. Needless to say JD of Tying It All Together is a beast and his site Fusion Knots is a must for anyone interested in tying.When I get to 30 bracelet types I will post a new picture. 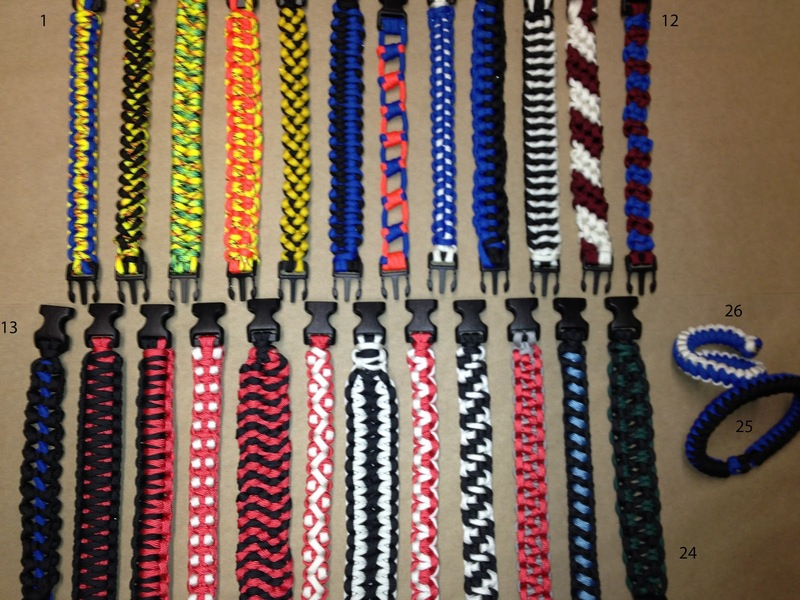 Look forward to an instructional video soon on how to make number 22 the Morse Code Bar as well as a new "Paracord Adventures - Key Chains" edition. ct. Chaotic Thinking - Where you never know what you'll get!